Welcome aboard the U.S.S. Genesis, captain. If you’re looking for more info on the last ditch effort to save humanity, we’ve complied a list of frequently asked questions to aid in you. Genesis Alpha One mixes thrilling roguelike mechanics with deep ship building and fast first-person action, putting you in the role of an interstellar pioneer. In a near future ravaged by wars, corrupt regimes and devastating pollution, influential corporations have created the Genesis program in a last-ditch attempt to save humanity. As the Captain of a Genesis starship, you journey into uncharted space on the ultimate mission. Build and manage a space vessel, explore the galaxy for resources and interesting new lifeforms as you clone new crew members. Your goal: Find new homes for humanity’s DNA and save the species from extinction. When and where is Genesis Alpha One releasing? Genesis Alpha One will be available on PC via the Epic Games store, PlayStation 4 and Xbox One on January 29th 2019. The Steam PC release is expected in January 2020. Is there a pre-purchase incentive? The Rocket Star Corporation Pack gives you access to 4 weapons – the Firebomb Launcher, Light Assault Rifle, Delta Shotgun and Kugelblitz. It also gives you a different aesthetic to your bridge. I missed out on the Rocket Star Corporation Pack as a pre-purchase bonus, can I unlock this in-game or buy the pack separately? None of the Rocket Star Corporation Pack items can be unlocked in-game. However, if you missed out at launch, our intention is to make this available to purchase at a later date. What are minimum requirements to run this on PC? What are the recommended requirements to run this on PC? What languages does Genesis Alpha One support? 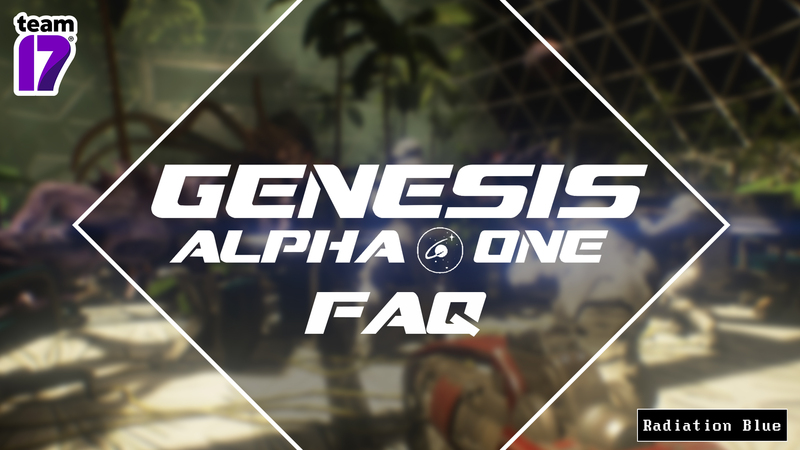 Is Genesis Alpha One a single-player or multiplayer game? Does Genesis Alpha One have multiple save-slots? As Genesis Alpha One is a roguelike, there is one save slot with autosaves being carried out when you perform certain actions in-game such as building new modules. Will the clones help kill aliens? Your crew will help you fend off the alien threat but you can order them to flee. Depending on just how overrun you might be, retreating may sometimes be your best course of action. Are the randomly generated planets fully explorable? While you’re able to visit every planet in the randomly generated galaxy, only the immediate landing sites are safe to explore. There are, however, artefacts and more to uncover as you explore the many planets, allowing you to unlock new weapons and technology as well as alien and resource locations throughout the galaxy. Any plans for VR support? Who developed Genesis Alpha One? Genesis Alpha One is being created by Radiation Blue, a small independent developer located near Freiburg, Germany. They have a long and varied career working for companies such as IO Interactive. The team have previously worked on Hitman Blood Money, RiME and The Settlers to name a few. They have partnered with Team17 who will release Genesis Alpha One as part of their game label. Where else can I keep up with Genesis Alpha One news?